Home / Blog / Remember when floppy discs seemed high tech? Nothing makes you feel quite as old as realising you can’t listen to the first single you ever bought without getting hold of equipment that today’s teenager would classify as retro. Or vintage. Or antique, even. Charming. Technology certainly has moved on. Would your younger self have believed that one day we’d be able to buy, store and play music on our phones, or watch movies on handheld screens the size of greeting cards? You’d probably have dismissed the idea along with Marty McFly’s hoverboard and Martin Bower’s teleport bracelet. 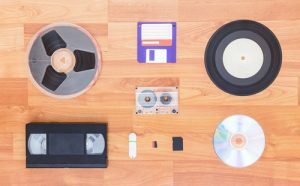 Much as we love the progress that has been made in these modern times, we can’t help looking back with fondness at some of the tech dinosaurs that have become extinct over the years…. Remember listening to the radio and waiting with your finger poised above the record button so you could tape your favourite tune when it came on? Without any of the DJ’s introduction, if you were really skilled. Fun times. Less fun was having to find a suitable pencil to wind the ribbon back in if it got chewed up in your old cassette player. Long before the PC vs Mac gang wars started, it was all about Betamax vs VHS. Whichever side you were on, there were definite disadvantages to the whole video thing, from the crazy convulsing picture when you pressed pause, to the chance for your mum to record over your favourite episode of the A-Team because you forgot to label the cassette. Is it just us, or do reel-to-reel tapes make you think of spy films? No? Just us then. These bad boys actually date back to the 1920s, but there are still plenty of them out there today, mostly boxed up in attics and warehouses for lack of anything to play them on. Sad, isn’t it? Now these made us feel like proper techies, and not in a bad way. “You need a copy of that report I wrote? No probs, won’t be a tick… no, no need to fire up the printer, I’ll just copy it onto a floppy for you.” Genius. Especially when they added that little ‘write protection’ tab so no one could wipe out all your hard work. Ah, nostalgia. If only we could go back, right? Actually, scratch that – no one needs to live through shoulder pads, mullets and Milli Vanilli again. But it is nice to take the occasional trip down memory lane, if only to laugh at the clothes you once thought made you look super cool. That’s where we can help. At Scan Film or Store we can convert old analog audio and visual material into DVD, CD, external hard drive or USB format, which won’t snap, tangle, unravel, fade or lose quality. That way, you can listen to or watch your old music or video footage on any modern machine, and ensure that your memories will last well into the future. If you’d like more information about how we can convert your old analog material to a digital format, just get in touch.